For regular readers, Timothy Corrigan needs no introduction. 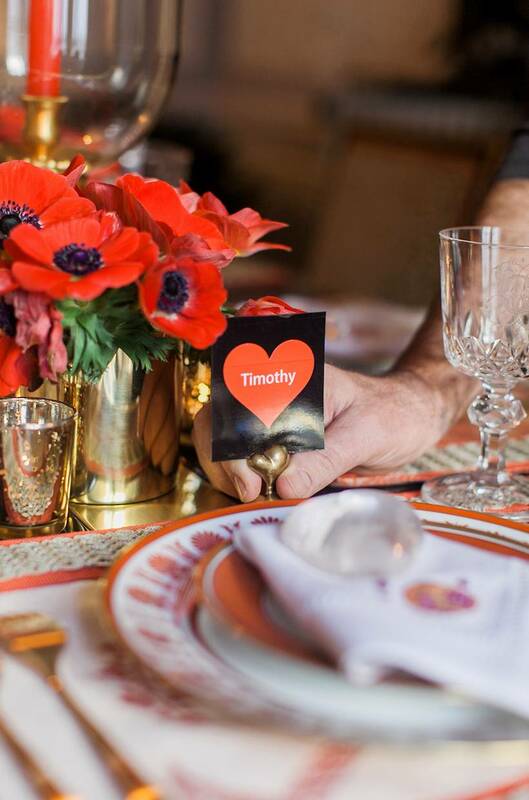 Our behind-the-scenes look into a holiday dinner party at his French chateau years ago is still buzzed about; his springtime al fresco lunch gave us total landscaping envy; and his casually elegant Easter brunch gave us a first glimpse into Timothy’s West Coast home. Oh, and as unofficial president of the Timothy Corrigan fan club, I even went so far as to get married at his Loire Valley property last year… now that’s dedication. I’ve always known that Timothy and I were kindred spirits, but today’s story makes it official. 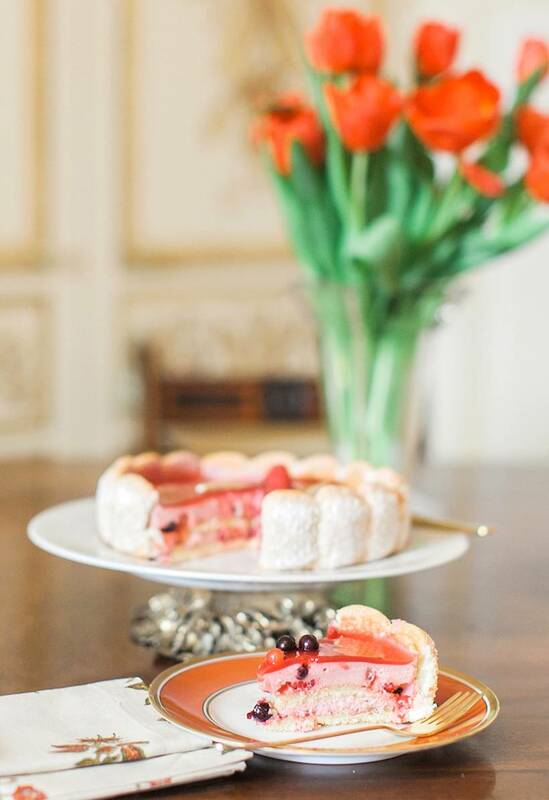 There’s no holiday that I love more than Valentine’s Day, and it turns out that our favorite francophile interior designer feels the same way. How’s he celebrating this year? 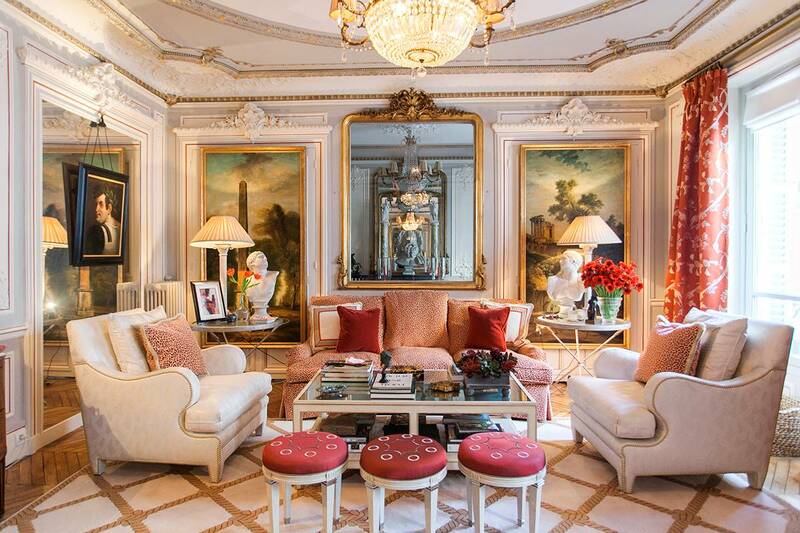 The only way he knows: with close friends around a beautifully set formal dining table, his newly renovated Paris flat a most amorous setting. Ready for some jaw-dropping inspiration? 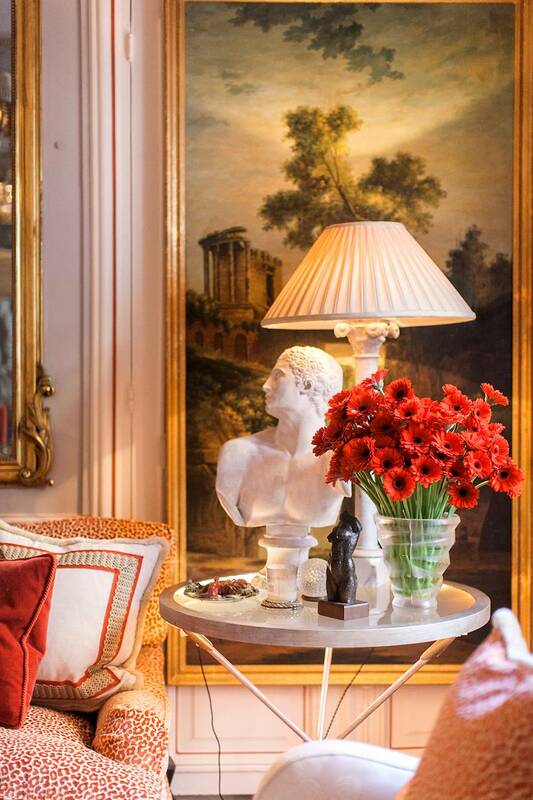 Keep reading for Timothy’s mouth watering recipes and hard-to-believe interiors. Tell us about this breathtaking space. We love that it is still very much aligned with the “Timothy Corrigan” aesthetic, but appears to be a representation of your personal style that we’ve never seen before. My new apartment in Paris is in the most incredible location one could hope for: on a tiny two-block long, one-way street that starts on the Faubourg St-Honoré just next to the Japanese and British embassies. 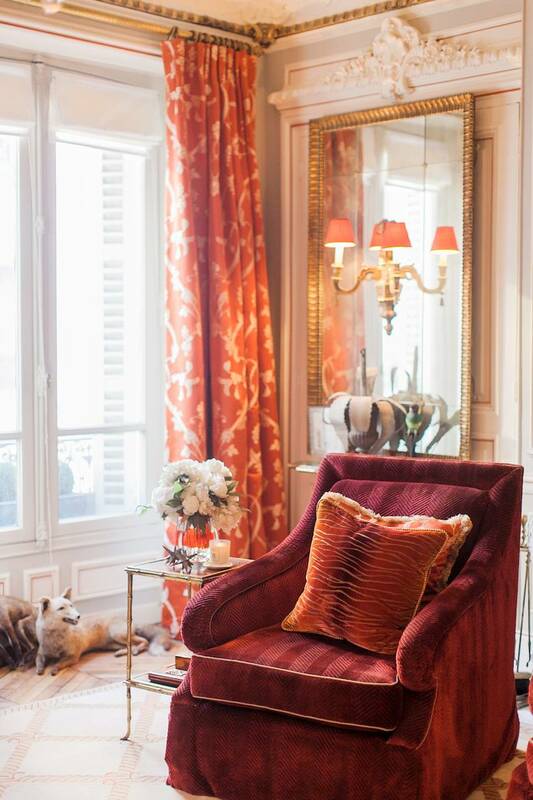 While it is within a two minute walk from both the Place de la Concorde and the Place de la Madeleine (and some of the best shopping in all of Paris), it is nestled away in a quiet little street that is as quiet as if one were in the country! The building itself is of the traditional Haussmann-style of the second half of the 19th century. With one apartment per floor, it has the feeling of a true home with light coming from both the east and west. The apartment has all of the original 19th century paneling and plasterwork, parquet floors and fireplaces in every room. The furniture is a mix of antiques from the 18th century, French furniture from the 1930’s and 40’s, and a few pieces of my own design for Schumacher or Timothy Corrigan Home. All of the fabrics in the apartment are part of my fabric collection for Schumacher. This mantle is everything. Tell us about the unique pieces you used to style it. I love mixing elements from different styles and periods together to create a kind of interesting display. 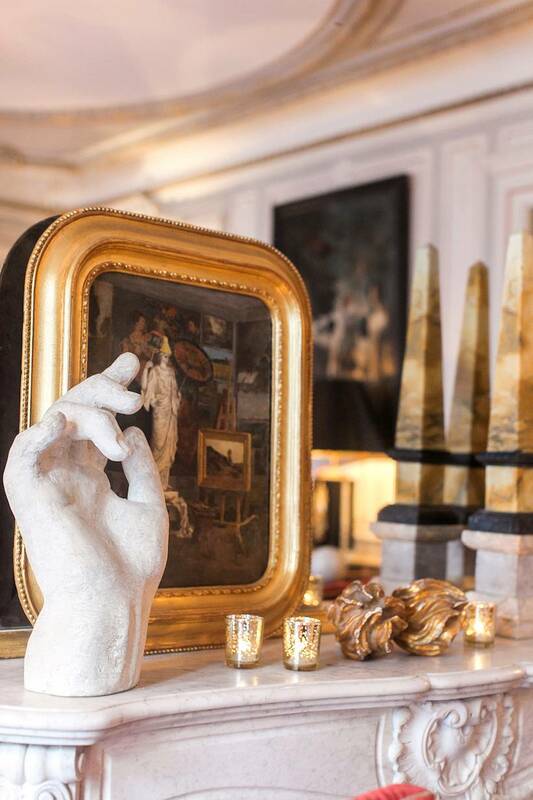 The large plaster hand was used in the 19th century for art students at the Academy des Beaux-Art in Paris to help them learn how to draw anatomy. The carved gold flames are Portuguese from the 18th century and were used in a large candelabra, and the painting is an amusing study from an artist’s studio in the 19th century. I think that the whimsical nature of how all the elements interact is fun. I too am a Valentine’s fanatic, but for any readers who don’t share our affinity: Why a Valentine’s Day dinner party? Since I recently finished decorating my new apartment, I’ve been looking for an excuse to host a dinner party. 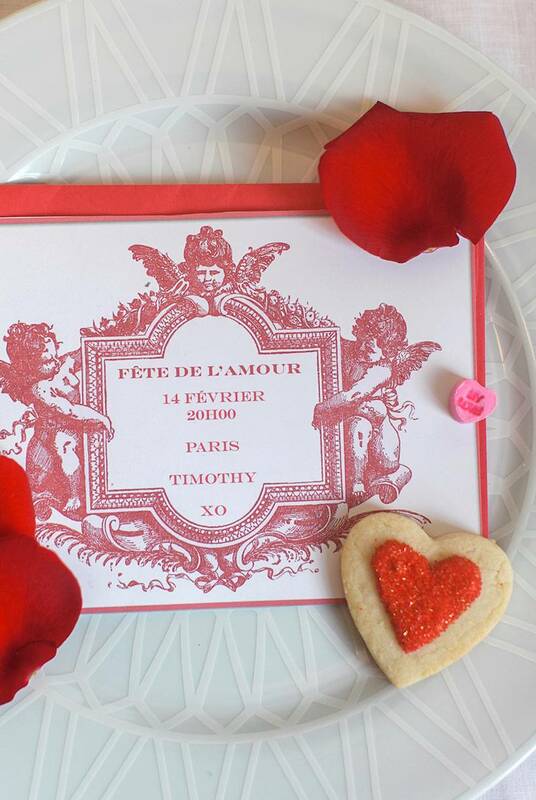 I’m always up for celebrating love, especially if it takes place in Paris! I’m not usually a fan of manufactured holidays, but Valentine’s Day is an exception; it’s a reminder to let the special people in your life know how much they mean to you. I love sending Valentine’s to friends just to let them know that they are special to me. For the invitation, I found a wonderful book of 18th & 19th century illustrations that I love to use when hosting parties. The cupids seemed a perfect choice. 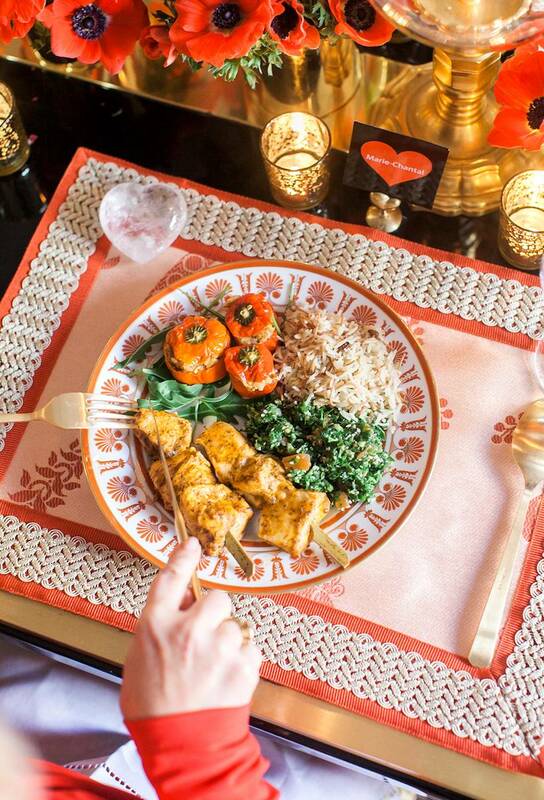 I wanted to create an elegant dinner that clearly celebrated St. Valentine’s, but avoided being too kitschy. 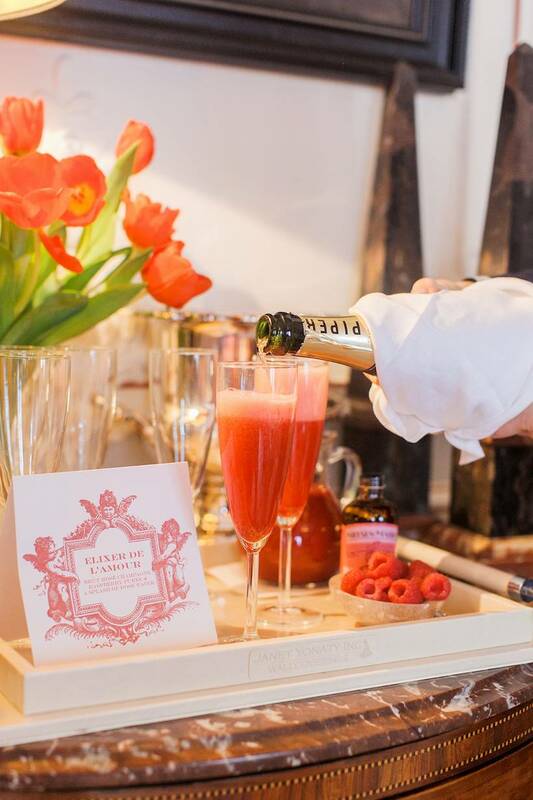 We’ll start the evening with a beautiful red cocktail, “Elixir de L’amour,” a mix of brut rosé champagne, raspberry puree and rose water. 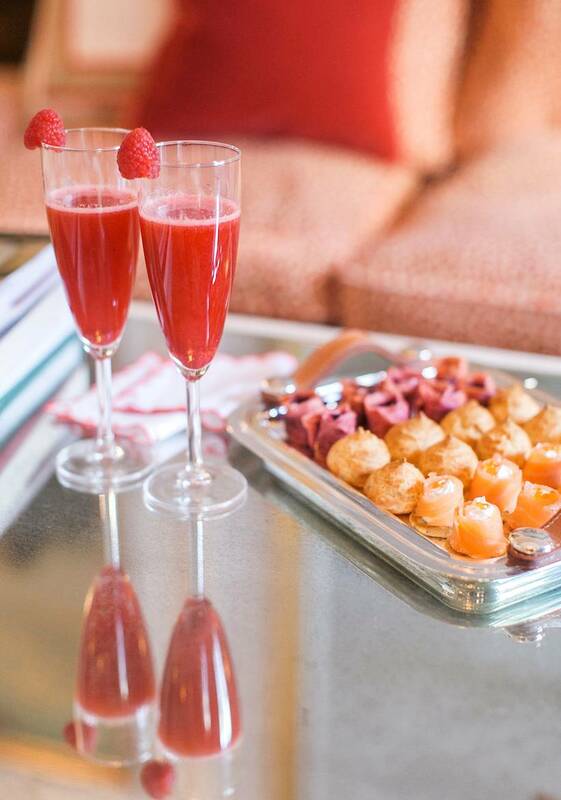 Accompanying the cocktail were “boutons de roses” — foie gras and cherry confit enrobed in thin slices of dried duck, “gougère” — cheese puffs, and “bouchées apéritifs au saumon” — smoked salmon filled with creme fraiche, whole grain mustard and golden caviar on a blini. 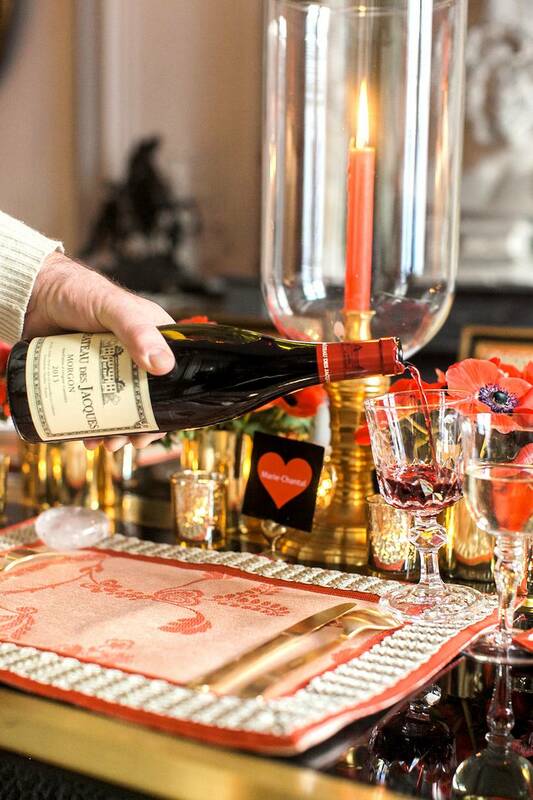 This is the dreamiest Valentine’s table we’ve ever seen. What exactly are we looking at here? 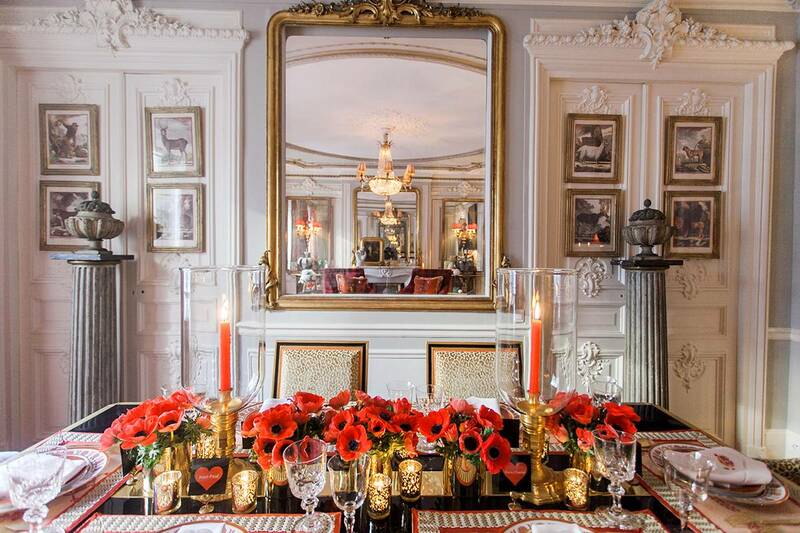 Rows of red anemones are displayed in brass vases, interspersed with gold votives and candlesticks. The Louis XVI dining chairs by Moissonnier are upholstered in my “Madeleine Velvet” and “Mandeville Canyon” fabrics for Schumacher. The heart place card holders were originally silver, so I spray painted them gold and printed the place cards on photo paper. The black lacquer and polished brass dining table is from the 1970’s and provides a dramatic backdrop for the custom placemats I had made using the reverse side of my “Parc Monceau” fabric for Schumacher and my “Sunset Strip” tape trim. 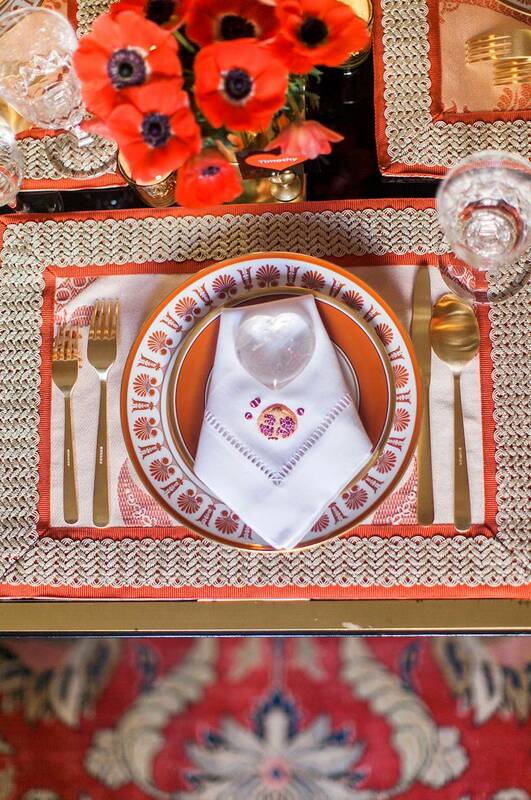 The linen napkins are hand embroidered with a pomegranate motif, a symbol of fertility. This plate look so tasty and colorful. What is it? 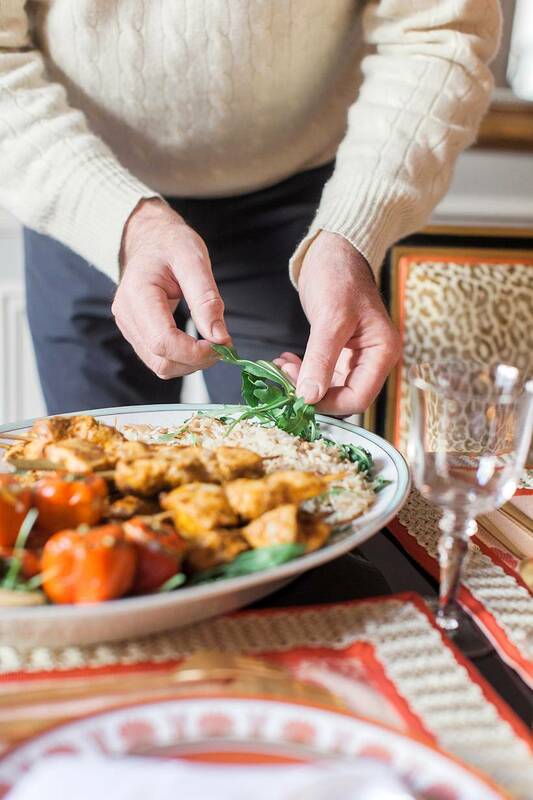 The main course was Poulet Provencal — skewers of chicken marinated in herbs, small red peppers stuffed with faro and ground lamb, wild rice and taboule. We love a good Valentine’s Day game. What’s this one? I always like to play games at my dinner parties because it’s a fun way to bring everyone together, and always interesting to discover the competitive nature of some guests. 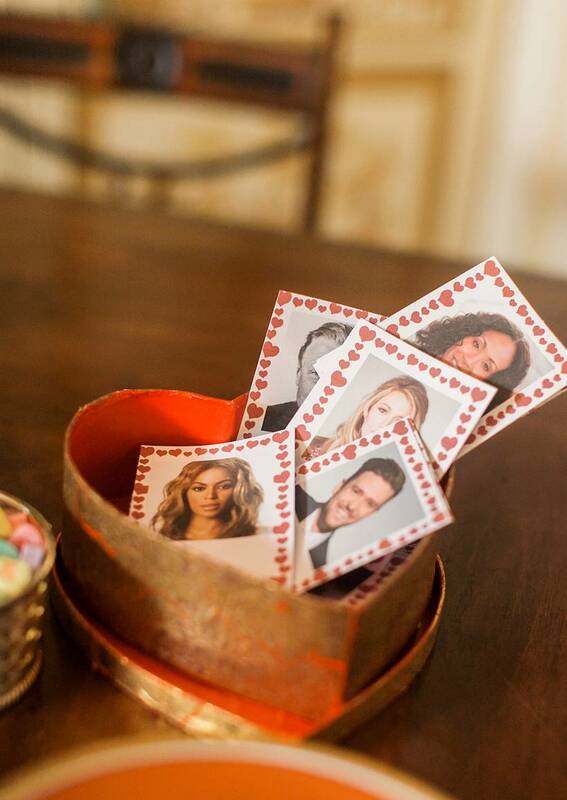 Each card had a famous person’s face, and guests had to guess who was the other half of that couple. We had couples as far back in time as Cleopatra and Marc Antony right up through Beyoncé and Jay-Z. I absolutely love your scented candles. 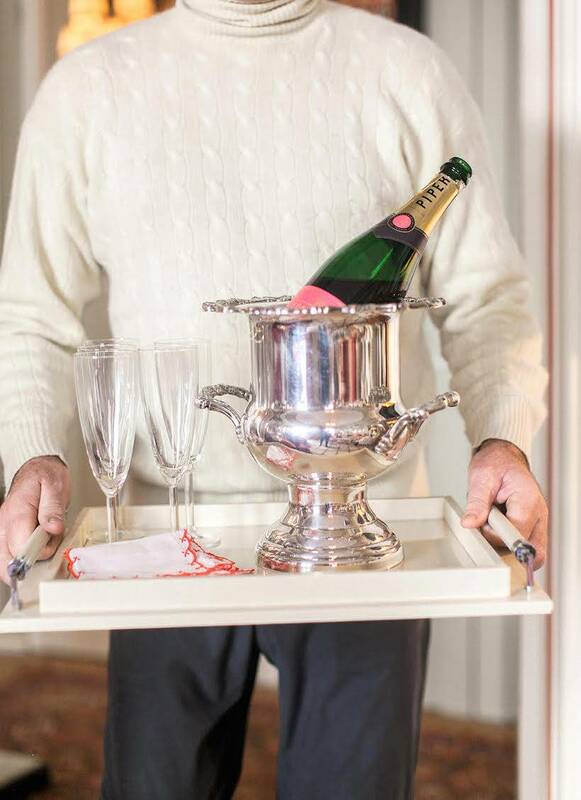 I can’t imagine a better favor to send guests home with. As a parting gift, each guest was given one of my signature candles; in this case it was “Maison de Ville” which was inspired by the glamour and romance that is inherently Parisian! 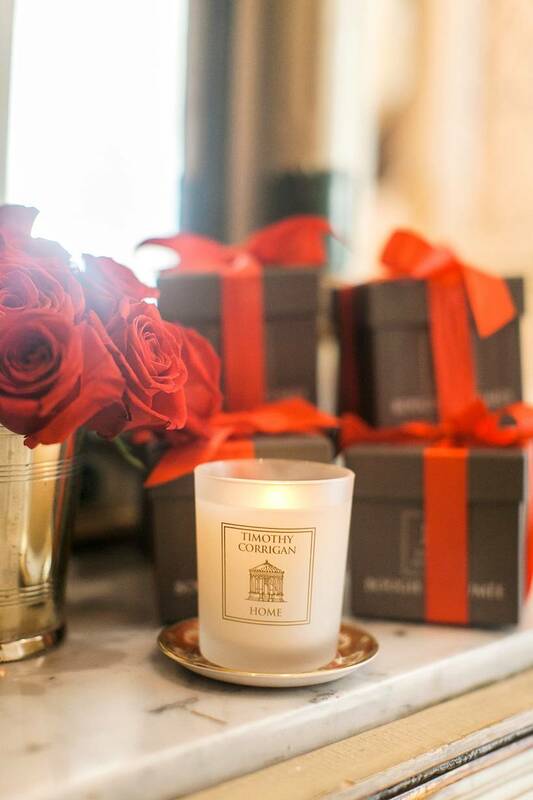 Whenever you burn the candle, you can’t help but be transported back to the city of love. In honor of Valentine’s Day, I am offering a special promotion for our candles: 25% of the proceeds will go to the Cedar’s Sinai Barbra Streisand Women’s Heart Health Center. We thought that partnering with a women’s heart charity made perfect sense for Valentine’s Day, and Barbra is a friend who has done amazing work in raising awareness and funds in the area of women’s health.